Last month, I revealed that the DWP was forcing jobseekers to take a fake psychometric ‘test’ – under threat of losing their benefits – as part of a sinister ‘behavioural control’ experiment on behalf of David Cameron’s ‘Behavioural Insights Team’ (BIT) or ‘nudge unit’. This story was picked up by the Guardian (and was one of its most-read items) as well as by other newpapers and even by BBC Radio 4. The letter given by the DWP’s Jobcentre Plus (JCP) stated clearly that non-compliance with the instruction to take the test could result in sanction, or loss of benefits. However, the DWP has since tried to weasel out of responsibility for its actions by claiming that the letter instructed ‘Maggie’ to take a ‘My Skills’ test, while the sinister fake test was called a ‘My Strengths’ test. The DWP continues to make this claim. Last month I sent a Freedom of Information Act (FOI) request to the DWP, asking for details of how many people had been made to take the fake ‘test’, and whether anyone had been sanctioned for failing to do so. The response insists that the ‘My Skills‘ test that ‘Maggie’ was ordered to take on pain of losing her benefits is a completely separate test – so that the ‘My Strengths‘ test linked in the form that accompanied the ‘Jobseeker’s Direction‘ was not actually mandatory. But this is clearly untrue. The original instruction to Maggie to complete the fake test was sent on 11 April 2013. On 17 April, the same day on which she met the JCP advisor to discuss the first test, she received a further letter instructing her to take a different skills assessment with a completely different web address for an even more confusing and complex test. But my story revealing the first test was a fake did not break until 18 April – a day after she was ordered to take the 2nd test after completing the first one. The same JCP advisor instructed Maggie to take both tests, on separate occasions, before the fake nature of the first test was made public. The 2nd skills test was therefore not given as a correction to an incorrectly-mandated ‘strengths test’ once the ‘mistake’ became public. It was given as a further instruction once the first one was completed. The ‘my skills‘ test in the first letter was therefore definitely the ‘my strengths‘ test that accompanied the letter – because a separate instruction was given for the separate ‘my skills‘ test on the day that ‘Maggie’ met her advisor to confirm that she had taken the ‘my strengths‘ test. And as the accompanying letters made plain, both tests were given as mandatory instructions with the threat of sanction for failure to comply. This isn’t all. The DWP’s FOI response confirms that jobseekers were ‘directed‘ to take the test – at the same time as claiming that it was voluntary! In answer to your request the ‘My Strengths’ exercise is not a mandatory one. The promotion of the use of the tool was intended to compliment a customer’s jobsearch activity. This has always been voluntary and although a very small number of customers were directed to use the tool this did not result in any sanctions nor was it considered mandatory. This pilot is not being run in any other part of the country. The ‘My Skills’ test is a separate activity. The DWP claims that the test was always ‘voluntary’ and was not ‘mandatory’ – but then admits that jobseekers were ‘directed‘ to take it. A ‘direction’ in this setting is a very specific thing and is always accompanied by the threat of sanction. No matter how much the DWP might claim that it didn’t consider the ‘test’ mandatory, it is admitting that it was presented as mandatory – with a financial penalty for non-compliance – to jobseekers. So, in the space of just a few lines, the DWP insists that jobseekers were not forced to take the ‘test’ – and admits that they were. If this were a criminal investigation (and it should be), this inability to get the story straight would be taken as a powerful indicator of guilt. Oh what a tangled web we weave.. Important update: I’ve emailed this information to the Work and Pensions Committee with a request to include it in their grillings of IDS due to take place over the next month or so. This story will run forever – or at least, as long as it takes for the DWP to come up with a story that makes sense. The rest of us have already come up with a story that makes sense, and the DWP’s continued efforts to fabricate something plausible from the material that is already publicly available only serves to confirm it. Here’s the next chapter in Skwawkbox’s exposure of the DWP’s fake psychometric test. Let’s hope the Work and Pensions Committee grills Iain Duncan Smith about this little wheeze as well as his other exaggerations of the truth, when they drag his sorry bones in front of them (as promised) in the very near future. I thought they were allowed to lie and be corrupt. Am I missing something? I pay less attention at the moment. 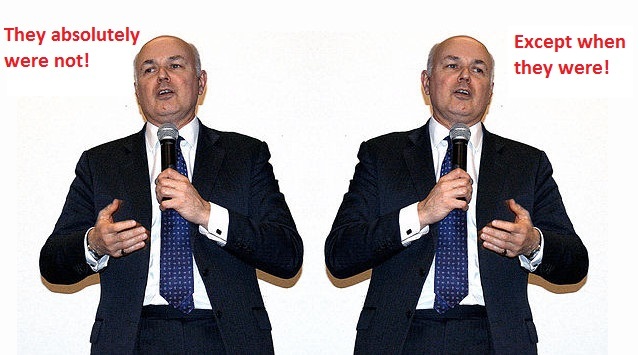 IDS is so inspiring, capable and charismatic that I worry about my heart rate just to think about him. 1. An excuse to sanction claimants. 2. Just to waste the time of an idler who has nothing better to do. 3. An exercise in control, allowing an advisor to impose their questionable authority. 4. Somebody, somewhere in the DWP had to come up with something to justify his or her salary and the existence of his or her non-job. Maybe it has a more sinister implication; once the hue and cry dies down, once this test is accepted as ‘the norm’ for claimants, maybe the test could be modified or a new test introduced to assess a person’s mental state; their political philosophy or even their intelligence. I’m sure you psychologists could come up with any number of other intellectual or psychological attributes that could be tested; the DWP could then use these results for all manner of nefarious applications. Does that sound paranoid; does it make any sense? Or am I, as I think reading it back, just being silly? Or maybe they are simply creating a solution to a problem they have yet to discover. IDS has a long history of lying and ,if you recall, of taking tax payers money to pay his wife a salary for work she wasn’t doing in 2002. The following is evidence given against him by one of his secretaries who told of other false expenses claims for haircuts, lunches and even underwear! Apparently she raised concerns about this and was treated to loud verbal abuse by IDS, reducing her to tears. Its a very long read but certainly reveals what a nasty dishonest scrounger IDS really is. See how they managed to turn a non mandatory group information session into a mandatory one. Bearing in mind there are no mandatory group information session in the Jobcentre Plus offer! The rules of the ‘game’, (referred to as the Freedoms & Flexibilities Jobcentre Plus offer or the Yes/No/Maybe framework) are constantly changing and this creates perverse behaviour as well as confusion for both staff and claimants. The claimant does not stand a chance of comprehending these unpublished rules and, therefore cannot effectively challenge their opponent (JCP). This inevitably leads to confusion and devastating consequences, particularly for the most vulnerable claimants . I hear stories almost every day about people being affected by the ‘game’. When you try to explain to the man in the street what is actually happening every day in Jobcentres up and down the country, they are often left scratching their heads wondering if the world has gone totally bonkers! There are 2 points to make here- 1) Consent must be sought for an activity which is not mandatory. This requires your signature. Always read before you sign and do not worry about the amount of time you take. You DO NOT HAVE TO sign. 2) Mandatory activities are ORDERS. The fulfillment of an order is CHARGEABLE. You may charge a fee!!! It is easy to consider this kind of behaviour harmless, it’s just a test probably multiple choice no one will even look at the results. However for a small minority this kind of thing creates huge problems. If you already suffer with a mental health issue these kinds of things can just push you right over the edge inducing states of paranoia and lead to psychosis. I have met a lot of mentally ill people (both diagnosed and on medication and undiagnosed and unmediated) who have seen their mental health spiral out of control as a result of the relentless hounding the DWP are subjecting them to. It is good that sites like this are exposing the truth about how the DWP are behaving. Keep it up. If that is the explanation I am glad I do not have to take the test!